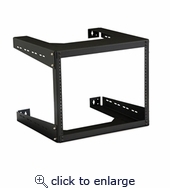 Two-Piece, Knockdown Design	The 18” Deep Open Frame Wall Rack includes two universal top and bottom frames and two universal rails that when mounted together, form a rugged and reliable network solution. 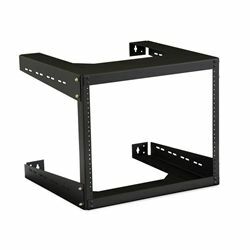 Cable Lacing Points	The top and bottom of the 18” Deep Open Frame Wall Rack feature cable lacing points making it easy to install, route, and manage network cables. Quick Assembly	By using a crescent wrench and a Philips head screwdriver or drill, within minutes your 18” Deep Open Frame Wall Rack will be ready to install on the wall.